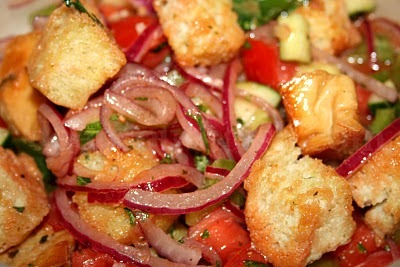 Panzanella salad originated from Italy from the regions Tuscany Umbria Marche and Lazio. This dish is especially popular in the summer period. The method of preparation at different seasons of the year is different and usually this salad is prepared with those foods that are available for that season. Slices of bread (without crust), chop them into smaller cubes and fried into skillet without oil. Peel the cucumber and dice into cubes. Clean and chop the onion. Mix all ingredients in a deep salad bowl. Separately mix the oil, vinegar, wrought garlic, parsley and pour over the salad. Decorate with chopped parsley. Enjoy in this healthy salad. Nutritional recipe list is calculated according to the quantity of the food used to prepare the recipe. Applies to the entire amount in the recipe.